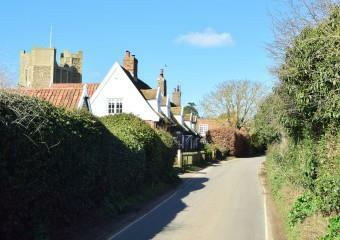 A delightful 16th century grade II listed coastal cottage, on Castle Hill in Orford, Suffolk. 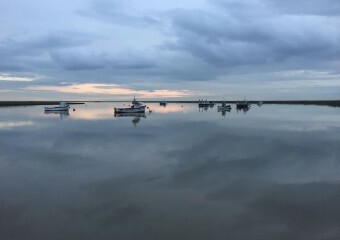 Keep Cottage is a beautiful Suffolk holiday cottage rental only a minute’s stroll away from Henry II’s magnificent Orford Keep and a short walk in one direction to Orford Quay and the famous Orford Ness or a short walk in the other direction to the centre of Orford village. With roomy accommodation for up to six, the property is a unique self-catering three bedroom cottage with a blend of contemporary and traditional styling. A natural place to relax and unwind with plenty of space to do your own thing or be sociable in the large sitting room. 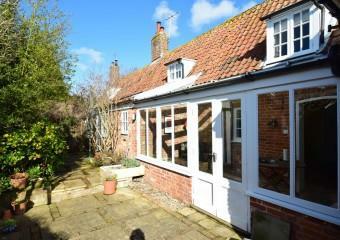 There are two gardens to enjoy and a patio area to soak up the balmy Suffolk evenings. The Cottage is located on the edge of the village, and Suffolk life is on your doorstep, with two great pubs, The Kings Head and The Jolly Sailor both serving excellent food and local Adnams of Southwold ales. The market square is also home to the Pump Street Bakery, The Orford General Store, The Butley Orford Oysterage and The Crown and Castle. There is also a delightful honesty store selling newspapers and magazines at the Village Hall.